Updates for 19 July 2018. Open skies: Who will fly to Guernsey? While all airlines operating in and out of the island would have previously needed a licence to do so, they can now run routes without going through the process. But which airlines could operate in Guernsey? One airline that runs out of Jersey - but not Guernsey - is easyJet. We asked them whether they would now consider running services in Guernsey. Flying to and from Guernsey continues to be an operational challenge for easyJet, however we continue to review commercial and operational opportunities and we will work with the airport should there be an opportunity in the future. Teaching unions in Guernsey have raised "serious concerns" over plans to have Ofsted (the UK government Office for Standards in Education) inspect island schools from next year. The Committee for Education, Sport and Culture in Guernsey have announced schools and colleges in Guernsey and Alderney will be inspected from September 2019. Andy Woolley, South West regional Secretary of the National Education Union (NEU) said: "It is completely wrong that this announcement was made without consultation with the unions representing teachers, lecturers and support staff." The union expressed "genuine concerns" about how the Ofsted system has "distorted learning and achievement" in English schools and urged the States to look at alternative inspection systems like the ones used in Wales, Isle of Man and Jersey. 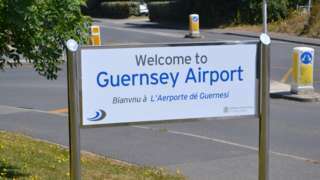 Guernsey Airport will "fully assess" the government's decision to adopt an "open skies" policy in the island. The States voted - by 22 votes to 14 - to deregulate Guernsey's airline industry, meaning new operators would not need to gain a licence to fly in and out of the island. It’s unclear at this stage whether today’s new policy decision by States members will influence any airline decision to come to Guernsey, as scheduling and routes are planned well in advance. We look forward to working with our colleagues at the Committee for Economic Development on enhancing air routes out of Guernsey in order to expand passenger choice of destinations. Guernsey's decision to adopt an "open skies" policy is "grounded on hope and optimism" according to the Aurigny. The States-owned airline has opposed the deregulation proposals since they were released by the Committee for Economic Development. The States of Guernsey voted through the plans through by 22 votes to 14. Guernsey's only high rise apartment building has been fitted with sprinklers as a safety measure in response to concerns raised after the Grenfell Tower tragedy in London. The Guernsey Housing Association worked with local company Domestic Sprinklers to complete the 12 week project at Cour du Parc flats. The association says the building already has smoke and heat detectors, a smoke extraction system, fire extinguishers and fire doors. With all the debate about safety in high rise buildings in the UK media we felt that if it was physically possible to fit sprinklers then we should do so. Hallucinations and sleep deprivation were not enough to make Dave Birch give up on his charity sailing challenge. 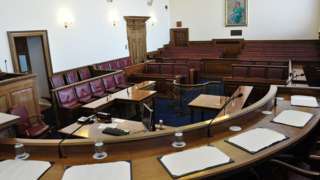 It could be another year before Jersey has a migration policy in place according to the island's chief minister. Senator John Le Fondre scrapped the previous migration policy plan, which was due to be debated in September. The last government's plan included time-limited work permits and criminal record checks for immigrants. He said it was not suitable in the uncertainty over Brexit and other economic problems. Jersey companies say they are having to charge more to make up for the rising cost of doing business in the island. A recent survey by the states showed that although they are trading more, companies are having to spend more on essentials such as raw materials and rent. Eliot Lincoln from the Chamber of Commerce says as costs rise, it's the customers who suffer. When you have increases in input costs, the costs of raw materials, the cost of paying staff, there is nowhere else to go. When those margins are so thin an increase in staff costs will lead you into a deficit then it has to be passed on. 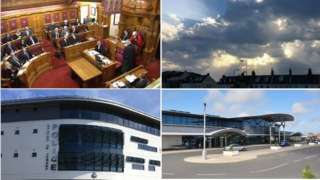 Guernsey's politicians have voted in favour of adopting an Open Skies policy for the island. This means that airlines serving all routes apart from Guernsey-Alderney and Guernsey-Gatwick, which have been designated as lifeline routes, will be exempt from the need to hold a local air transport licence. Jersey's Chamber of Commerce has welcomed the news that the government of Jersey has decided to scrap a planned new migration policy. A spokesman for the chamber says there is too much uncertainty in the economic climate to impose the policy as it stands. The chamber says while they welcome the scrapping of the previous policy it was not a signal to "do nothing" and it expects the States to do something to help recruit and retain staff in the island. I am determined that the migration policy taken by the Council of Ministers to the States Assembly will be the right one, and one that has taken account of the views of all stakeholders. The former cable car station at Fort Regent in St Helier will be demolished this year. The cable cars connected Snow Hill to the Fort Regent Leisure Centre and operated from 1970 to 1991. The States of Jersey has appointed demolition company DB Cummins to complete the £866,000 project. It's the first ministerial decision of new Infrastructure Minister, Deputy Kevin Lewis, who said it "would contribute towards the removal of this increasingly dangerous structure." Honorary police officers could be allowed to stay in the job for longer in future under proposals by the head of the St Helier force. Currently honorary police officers have to be between 20 and 69 years old to serve but St Helier Centenier Danny Sacaife wants the retirement age to be extended. This is in part to help with recruitment for the honorary police force. Each island has its own dedicated force and centeniers are elected by their peers. they are also the only people who can charge someone arrested by the paid States of Jersey Police force. St Helier Centenier Danny Scaife says if changes are agreed, they will need to be approved by the States. The driver of a car that "run off the road" at La Moye in Jersey escaped unharmed. Firefighters were called at 03:30 on Thursday to the corner of La Moye School in St Brelade. Officers say the driver was able to free himself, was unhurt and there was very little damage to the car. Jersey Fire and Rescue Service made the vehicle safe and have handed the incident over to the States of Jersey Police who are investigating. There are "no concerns" over water supplies in Guernsey, with stores 93.3% full according to Guernsey Water. Operations manager John Holt says islanders certainly shouldn't be wasting water, but he's not concerned about supplies. The news comes as Guernsey is expected to enter "absolute drought" later - something Jersey went into on Wednesday. However, Jersey reservoirs are 83.3% full and Jersey Water says there are no concerns over supply issues. Guernsey Water said demand in June was less than in 2017. The peak was on 25 June when 15.5 millilitres of water was supplied. It added it was not unusual and usage was higher on two occasions in June 2017. The peak so far this year was 16.9 millilitres on 8 July but it is some way below the July record of 23.5 millilitres from 2002.